Valve offered a big Dota 2 Battle Pass reward last year with a statue of Baby Roshan. 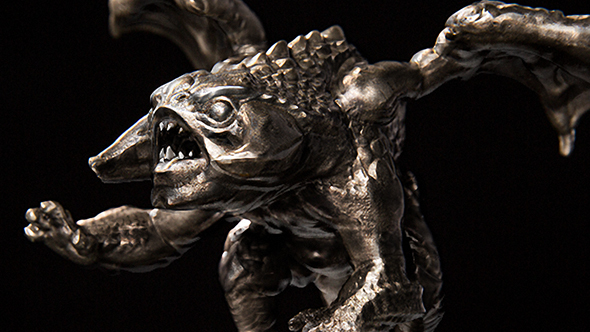 A physical statue to take up space on your shelves and in your hearts, this Baby Roshan looked very impressive with a nickel silver finish, promising to be a weighty and intimidating presence in your life. After a long, long wait, players have finally started receiving their Roshans by mail and, uh… Well. The final product is a bit less “nickel silver” and a bit more “chrome-esque mud.” Maybe you could attribute the less-than-flattering finish to the lack of pro lighting – sure, but that also means ignoring the awful joint work and entirely flat look all around. It looks appropriate for, say, a $10 figure from your local toy store, but perhaps not the premium product Valve were hoping to release. Let us help you decide on the best MOBA. Getting to level 2000 in the Battle Pass – the requirement to be sent one of these Baby Roshans – is quite an achievement, and one that would take either an inhuman amount of grinding or more realistically a whole lot of money. Given the cost associated with getting hold of one of these figures, the outcry starts to become a lot easier to understand. If you’ve gotten an ugly Baby Roshan, please hang onto it when your new and improved version comes. The ugly baby deserves your love too, even when its less horrifying new siblings come around.